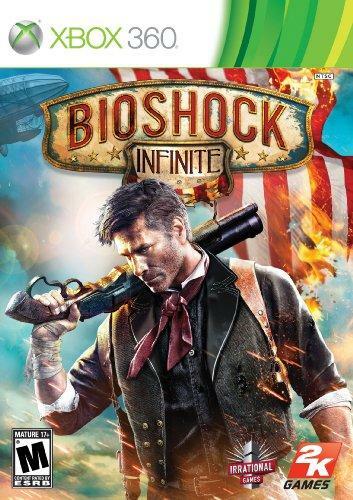 Though it shares many gameplay elements and plot themes with its predecessors, Bioshock Infinite is set in a place and time very different than Andrew Ryan's city beneath the sea. The year is 1912 and protagonist Booker Dewitt has accumulated debts so significant that his only remaining means of repaying them is apparently to travel to the floating city of Columbia and retrieve a young woman named Elizabeth. While Jack experienced Rapture after it had fallen into chaos and disrepair, Booker enters Columbia shortly before it is scheduled to go to hell in a hand basket. His initial encounters with citizens - children, police officers, carnival-goers - do not see the inclusion of gunplay, save for a few carnival games that act as quick tutorials. 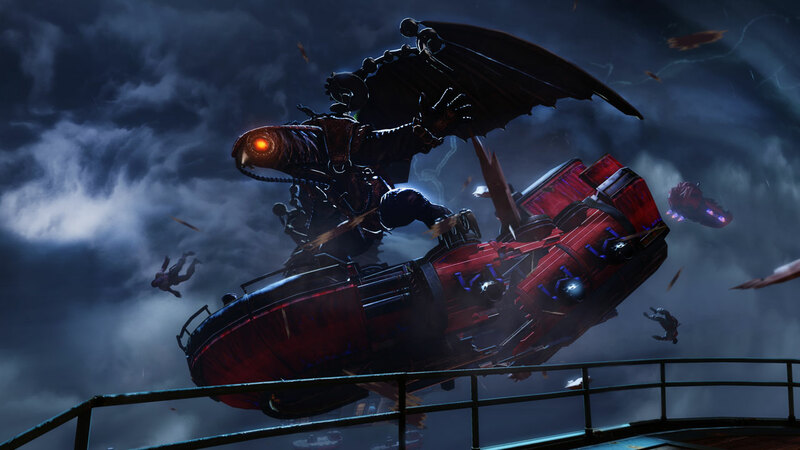 While technology such as mechanical horses, the skyline rail transportation system, and the large balloons that keep buildings afloat are more fantasy than factual, the game does a remarkable job at balancing the two and creating a world that, highly creative as it is, allows players to suspend their disbelief for the less than fifteen hours it will take to complete Bioshock Infinite. The Unreal Engine has certainly showed its age over the past few years, but Infinite does a nice job of masking the majority of the engine's shortcomings or simply avoiding flaws altogether through elements of its design. While the highest settings on the PC version of the game look downright gorgeous, the console release still looks impressive and is a significant step up from the visuals of the previous two Bioshock titles. Rays of light dance across rooftops and down alleys, while the occasional storm appears as dark and foreboding as it does dangerously powerful. Columbia is brightly colored and its citizens full of life. They have a lot to say, with those loyal to Comstock being a generally racist and prejudiced lot, and those loyal to revolutionist Daisy Fitzroy's Vox Populi camp being equally passionate and violent. The exchanges shared between Booker and Elizabeth, the ideas festering in the minds of Columbia's denizens, the billboards and posters that decorate the floating cityscape - all of it goes a long way toward immersing players in this fictional world. And with such a perfect balance of steampunk-style characters and vehicles with real-world events and ideologies presented, Bioshock Infinite is nearly as much a work of science fiction and fantasy as it is a period piece on 1912 America. 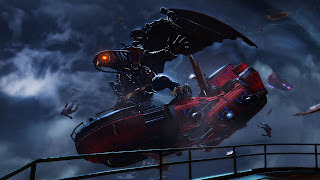 The combination of vigors and guns does not feel as wildly inventive as it did when it debuted in the original Bioshock nearly six years ago. 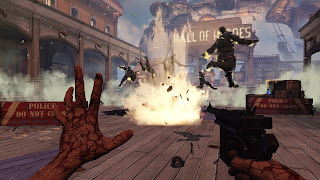 There are a few guns that are thrown in the mix that are fun to use, impractical as they may be for facing down larger groups of foes (especially on the higher difficulty settings). Meanwhile, there are more automatic and semi-automatic firearms than need be. 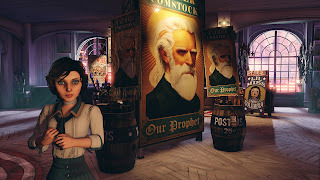 Whereas Irrational Games and 2K hit the nail on the head with the types of guns available in Rapture, there are some in Columbia that simply aren't needed. Because they are older weapons, the kickback on automatic firearms is greater and the range of rifles somewhat limited. It's a nice touch of authenticity on Irrational Games' part, and thankfully none of the guns feel terribly clunky. Booker can also get up close and personal with enemies, smacking them silly with the end of his skyrail hook, and finishing them off in genuinely brutal and bloody ways. Still, aside from the occasional use of a crank gun that Booker can salvage from a downed Motorized Patriot, none of these weapons evoke the same guilty pleasure as dispatching Rapture's splicers with the spear gun or drill. Vigors are a welcome variation of the familiar plasmids, as Booker is capable of utilizing each for both ranged attacks and traps - much like Bioshock 2 allowed you to add a dash of lightning or fire to a cyclone trap, but without demanding the extra trouble of layering two separate vigors on top of each other and spending double the salts (Infinite's equivalent of EVE hypos) in the process. Though vigors see more varied application than the almost exclusively straightforward-combat purposes of plasmids, some will outlive their usefulness early on - interestingly enough, most of these are ones that attempt to break conventional use. Though the game does explain why vigors exist in Columbia in brief, they are not as integral to the story as plasmids were to the downfall of Rapture, due to the lack of nasty mind-addling and physically mutating side effects. Skylines connect the different parts of Columbia, acting as a sort of railroad in the sky for the people to transport goods from one portion of the city to the other. 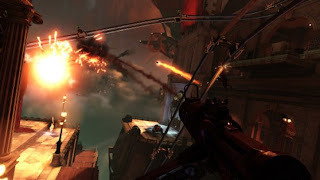 Though you will occasionally see box cars on the move, the primary uses of the sky rails for gameplay purposes are divided between transportation for Booker and Elizabeth and a means for Booker to gain the upper hand on his enemies, firing upon them as he zips by. This means of mobile combat works surprisingly well, as Booker can speed up and slow down, and can even lunge toward any enemies that might attempt to pursue him via the same skyline, knocking them back to ground or even to certain doom through the clouds. When Booker and Elizabeth are not in the sights of enemy guns, the skyrails present an exciting new view of Columbia, and are much like a roller coaster. 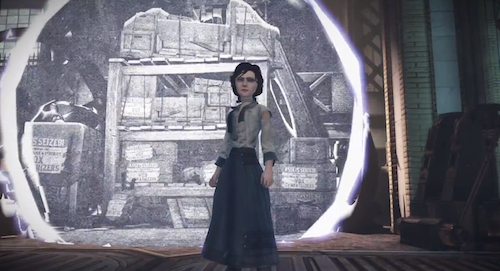 Whereas the Rapture titles incorporated Tonics as a means of bonus abilities, Bioshock Infinite allows you to seek out and equip different articles of clothing. Up to four can be worn at a time, and these include (but are not limited to) typical defense/offense bonuses, increasing the likelihood that you will receive ammo drops from defeated foes, the ability to temporarily stun foes when attacking with a certain weapon, gaining brief invulnerability after dismounting from a skyline, and replenishing health after melee kills. Infusions can also be found throughout Columbia, with some of them more or less shoved in your face and others hidden in some rather hard-to-find (or sometimes, easy-to-overlook) locations. Infusions are used to upgrade the capacities of Booker's health, shields, and salts, though when it all boils down to it, it's generally the best bet to simply boost shields and salts, since foes have to break through Booker's shields to damage his health. Much like Rapture's audio diaries told the tale of the fall of that city, the Voxophones scattered throughout Columbia present private recordings by the likes of a young girl enchanted by Elizabeth named Constance Fields, industrialist Jeremiah Fink, Booker's old military comrade Slate, and many more. While these are nowhere near as prominent for filling in plot holes as they were in the previous two Bioshock titles, they still serve well to expand the storyline and better flesh out the major characters. For those curious about the founding of Columbia and the ongoing conflict between Comstock loyalists and the Vox Populi, there are kinetoscopes - black and white silent films that last about twenty seconds a piece - that are as much propaganda pieces for the people of Columbia as the radio announcements decrying Frank Fontaine as public enemy number one were for the people of Rapture. While Songbird is perhaps the most iconic specialized enemy in the game, he is more a plot device than anything else. The other Big Daddy-style enemy Booker will encounter is the Handyman, a fast-moving, heavy-hitting (literally, since he punches and throws objects) man in a clockwork suit. The Handyman is not particularly smart, but Booker almost always encounters one when he is taking on a group of enemies, requiring you, the player, to divide your attention between them. The Handyman's weak spot is his heart, contained in some sort of glass chamber within the center of his chest. Any attempts to avoid the Handyman by jumping onto a nearby skyline will be a short-lived experience, as the clockwork monster can attach himself to the rails and electrify them to damage Booker. There are turrets that fire different ammunitions found in some of Columbia's more fortified locations, but most are rather easy to destroy. The Motorized Patriot, on the other hand, is a force to be reckoned with as he is essentially a fast and highly-mobile turret. Inspired by the Hall of Presidents animatronic likenesses of George Washington and Abraham Lincoln, these automatons recite patriotic rhymes as they spray rounds from their crank guns. The Boys of Silence harken back to the more horror-driven elements of the original Bioshock titles, acting as cameras that will summon many enemies to swarm Booker if they detect him. Meanwhile, the Firemen and Crows are basically just slightly specialized characters who can utilize a single vigor and have greater health than most footsoldiers. Social unrest in Columbia has given rise to the Vox Populi, a revolutionary group that means to raise arms against Comstock's men. Part of the game will see Booker and Elizabeth attempting to track down munitions for Daisy Fitzroy and the rest of the Vox, and over the course of this the two gain a much different perspective of the conflict - one from the slums of Columbia. While there is a decent payoff with the Vox Populi subplot, as a group they come across largely as a typical gun-toting gang upset with the current status quo. Daisy Fitzroy isn't in the game much, save for a few key exchanges with Booker, though it feels like Irrational Games had something much greater in mind. Unfortunately, what is included in the game isn't nearly as interesting as what might have been. The choices you make at a few junctures in the game aren't really as important in the grand scheme of things as the game originally leads you to believe. Decisions like which pendant Elizabeth should choose or the potential for Booker to get stabbed in the hand offer little more than minor aesthetic changes in the appearance of these characters. Falling off the city's edge simply results in Booker respawning where he stood moments before, with no reduction in health or salts, so on the off chance that you accidentally jump too far too fast or mistakenly jump off the skyline at a point where there is no ground to catch you, it's as simple as "no harm, no foul". Much like the previous games utilized Vita-Chambers to overcome the issue of the protagonists' mortality, Infinite has Booker relive a dream sequence, opening the door to his apartment and stepping back out to the streets of Columbia each time he 'dies'. Each death has a small price attached to it, however - Booker will lose some money, only respawn with half his health, though he will have some salts and ammo at his disposal. His enemies, on the other hand, will have regained some of their own health. While Booker does not have Elizabeth at his side for the first hour or so of his exploration of Columbia, the game is plotted as such with good reason - the idea is that you familiarize yourself with the Vigors and guns available, as well as take time to breathe in the world around Booker, before zeroing in on the girl he's come to rescue and getting the real story underway. Almost immediately following Booker's partnership with Elizabeth, the game informs you that she can handle herself, and that there is no need to keep an eye on her during firefights. Instead, Elizabeth can scrounge up salts, ammo, and health for Booker, tossing them to him in the midst of battle. The amount of what she finds is limited, however, and one should not rely on her entirely. A few hours into Bioshock Infinite, after Elizabeth has become more trusting of Booker, she will offer the idea of opening tears in reality to provide Booker with barricades for cover, sky hooks so he can gain a better vantage point for firing, and even friendly turrets. While these are all useful enough, it is a bit disappointing to see the use of these tears limited to three basic, repetitive uses, though they are what most distinctly separates Bioshock Infinite's core gameplay from that of the original two games. Elizabeth is a genuinely interesting companion character, and is - at least for the better portion of the game - arguably a more interesting study than Booker. While we know from the start that Booker was sent to retrieve Elizabeth as a means to rid himself of his debts, that's really all we get for quite some time, but is really all we need for that period as well. Elizabeth has been stuck in her tower for her entire life, interacting only with Songbird and blissfully unaware of the fact that she has long been both the central object of the study of opening the tears in Columbia and Prophet Comstock's heir. When Booker breaks her out of her cage, Elizabeth's behavior is equal parts curious and vengeful - she has never seen or interacted with so many regular people and places a great deal of trust in Booker as he is the only individual to have ever attempted to free her from her prison, yet she fails to understand what it is Comstock wants with her and why he would simultaneously spout forth holy words and rain cannon fire down upon Booker. Truth be told, Bioshock Infinite is not a terribly challenging game. If you've completed the other two on normal difficulty, you should find Infinite's hard mode to be comparable. However, regardless of the difficulty setting, there are some notable spikes in the challenge factor during the game's last few hours. A boss encounter or two will require plenty of ammo and salts, and the waves of footsoldiers aiming to foil Booker and Elizabeth's plans will require plenty of patience, strategy, and the ability to act quickly on your feet. It's not an unwelcome addition by any means, but the fact that the spike in difficulty is so sudden proves, at the very least, a bit frustrating. One of the inclusions Irrational Games touted prior to Infinite's release was that of a 1999 Mode, which was meant to amp up the difficulty factor even more so. In reality, the foes Booker faces in this mode aren't notably more challenging than they are on the 'hard' setting. However, since Booker loses some cash each time he dies, 1999 Mode presents the possibility of an actual 'game over' - if you run out of sufficient money for a respawn, then you are sent back to the main menu. 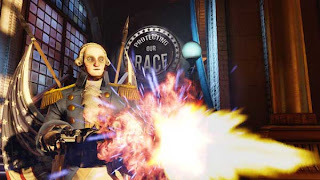 The final portion of Bioshock Infinite plays out in a manner not quite the same as the traditional reliance on the combination of vigors and firearms. It does, however, answer the vast majority of those important questions not laid to rest during the course of the main game. While nearly all of it makes sense, there is one bit that goes against principles laid out since the early hours of the game. As such, this particular point comes across as not only self-contradictory, but a cheap cop-out as well. Nonetheless, Irrational Games should be commended for everything else the story does right, and for creating such an adventurous new narrative. There's simply not enough new or expansive in terms of gameplay to rank this game among the greatest of this generation's consoles.